First and foremost - George Ritchie. I have known George since we were friends at school, and he moved down from Manchester in 2010 to get involved with what I was doing. He became an equal partner in Overhead Wires and was an integral part of the entire operation for 4 years - planning, promoting, accounting, van driving, being the "blues correspondent" and stopping me from making silly decisions. George was pivotal in helping to make what it became. Aimee Morris - continuous love, patience and support, including many lifts with equipment late at night. Abigail White was another key part of admin and logistics for a few years. She also showed me how much PA system you could fit in a Ford Fiesta, and made superb wristbands. All past and current members of Jipsy Magic/Meta Cassette. Overhead Wires managed this band for many years, touring the UK and putting out records, solidifying us into a family unit. Andy Hillion - showed belief in what we were doing from the off and let us lay camp at The Brunswick for our regular events and experiments. Your continual support has been brilliant. Andy Voakes - the happy snapper behind the camera, documenting most of our gigs for the final 2 years. Andy Rossiter - providing a lot of helpful advice on live promotion in the early days. Being patient with the many questions I had. Laura Karim & Jimmy Milonas - The Mucky Duck became a bit of a second home for us for many years; and the support provided by these two will always be remembered. Sally Denyer - Letting us set up shop at Three Graces in the very early days to begin regular our live promotions adventure. Big cheers to the following people too for their various integral involvement through the years: Pete Jones, Nolan Howard, Rob Beattie, Paul "Chippy" De Souza, Maria at The Cobbler's Thumb, Bernice MacDonald, Pippa Langridge, Stuart Huggett, Mik Hanscomb, Paul at The Lectern, Jack at The Quadrant, Jack at Busker's Bar, Jeff Hemmings, Sophie Roberts, Nick McKenna, Dan Markland, Dei Machiavelli, Daniel James Holeyman, Jake Mackay, Alfie Bernardi, Harvey Summers, Tom Ayres, Matt Brown, Dean Marsh, John Pheby, The Lanes, Oh Captain!, Chuck SJ Hay, Bob Duffield, Kate Williams, Sanity FM, Steven Proberts, Jordan Thomas, Mark Stack, Jonno Cox, Agatha Hayward, Mill Goble, James Bandenburg, Mike Garrett, Hanterhir, Half Hour Hotel, Tom at The Franklin, Georgia Challinor, Jules at Acklam, all the staff at Cobham services... and of course... all the beautiful bands we put on and wonderful people we met. It has been (and will continue to be in different capacities) an honour to be part of the grassroots music culture of Brighton! 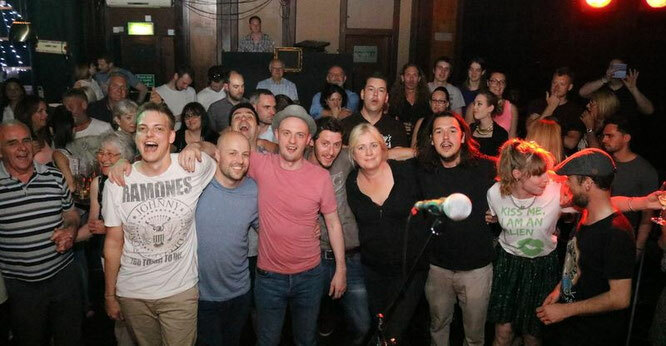 Picture above taken whilst the last chords rang out at our final gig at The Brunswick, May 2017.